I have found a new home! 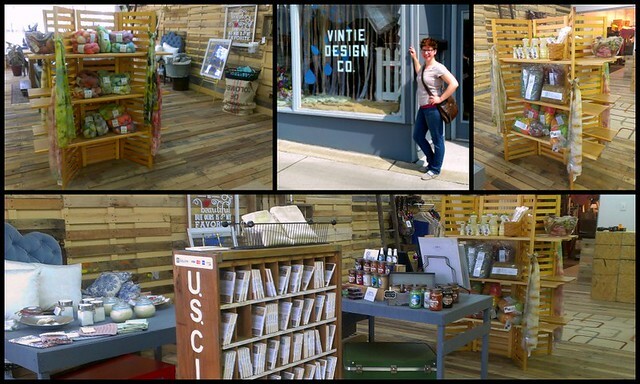 Today I went to The Shop on Liberty Street in Hubbard, Ohio and set up a display of my items. This means you can now purchase my fibers on your own time, as long as you don’t mind coming to Hubbard. 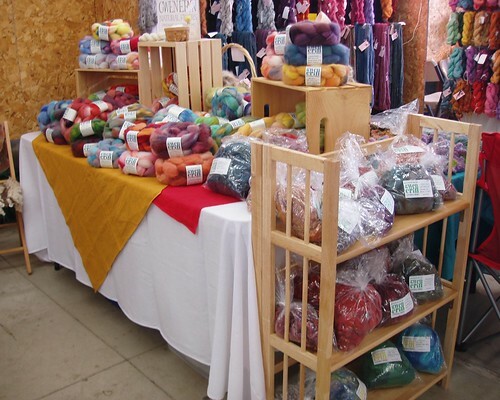 So far I have silk scarves, spindles, Eucalan, combed top, batts, and felting packs. As the summer progresses I will continue to add items. Not only do I have this retail display, but in the back I will have a workspace for dyeing and storage for my bulkier wool. I can’t wait to get this stuff out of my house! Especially since I just ordered three more bumps (bump = approx 22 lbs). Of course the hope is that having this space will increase productivity (wasn’t that my new year’s resolution in February? ), but I’m sure it will take some time to adjust. 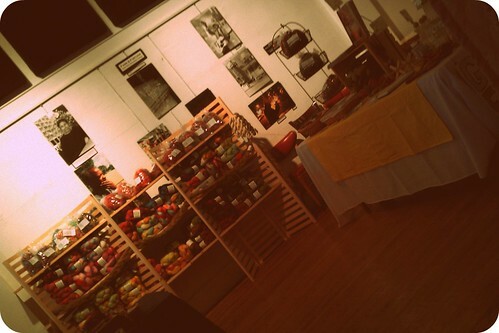 Having this great spot will open the door to many neat things such as classes and demos, pop-up shops, and consultations. 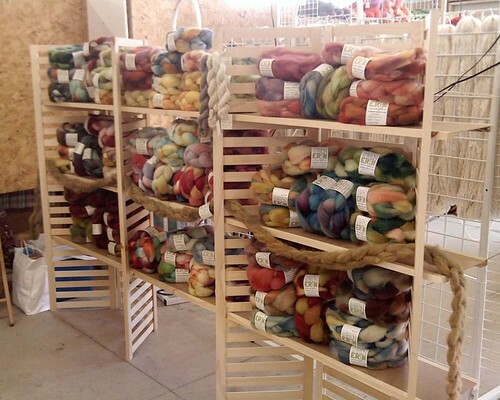 My plan is to be in the shop at least one day a week either for dyeing or spinning. However, I live just down the street, so if you are coming and want to see something specific, call ahead! I will bring additional items for your perusal. If you are having problems with your spindle or wheel, let me know! And did I mention there is also a coffee counter at the back? Summer Festival of the Arts! I’m super excited about this weekend for a lot of reasons. 1) It’s the Summer Festival of the Arts at YSU. Which is awesome all by itself, but I’m going to be vending there for the first time! I’ve been going to this event for years. First just because it was a fun family activity. Then I started working on campus, so I would work that weekend and get to enjoy the food. And for a few years our SCA group did a demo. Now I get to really be a part of it by having my own little tent! 2) I’m doing the show with a friend of mine I’ve mentioned before: Amber. 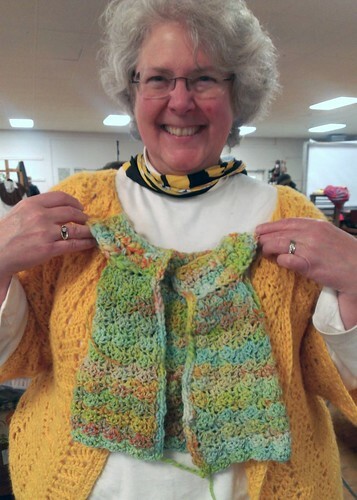 She’s an awesome crocheter, but her main thing is beekeeping and urban farming. She makes lovely lotions, perfumes, and lip balms with the various things she grows. Our products together are going to look awesome! I just can’t wait to see it. Planning out the booth with her yesterday made me so happy. Check out Wick & Fifth. 3) New display! I’ve been wanting to display my knitwear in a different way, but I just wasn’t sure how. Laying the stuff flat on the table is so dreary. I really love tiny clothespins and I thought hanging the items up would make them more visible, but I would need a sturdy line on which to hang. What would I attach the line to? It can’t be something that would fall over under the weight. Since I’ll have a tent frame, I’m going to attach the line to the legs at the back. I won’t have to bring anything extra and there is no risk of it fall in on itself. Success! I hope. 4) Along with the knit items on the clothesline, I’m going to hang photos I’ve taken during the spinning, knitting, and dyeing process. 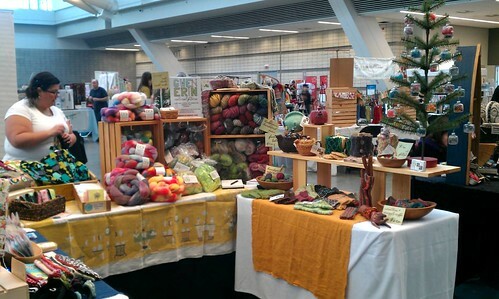 Many people at craft shows don’t understand what makes these items special; they don’t know what “handspun” means. I’m hoping that seeing the photos will either explain things to them or at least encourage them to ask questions. Plus it will look awesome! The only thing that is crushing my spirit is the weather forecast. It’s supposed to be nice on Friday, which is good since we’re setting up that day. But there is a 40% chance of rain for both Saturday and Sunday. WHY?? It’s never rained any other year I’ve gone. Why this year? Oh, now it says no rain Saturday, but a higher chance on Sunday. Maybe by the weekend there will be no chance? All I can do is forge ahead and bring my sidewalls. I was so jazzed when I found out that Walgreens will print square photos directly from Instagram! I went through my year’s worth of pictures and selected ones that represented my work in progress. In an hour I went to pick them up. How cool is that? I threw in a few pictures of Olive, my cat, just because I don’t have any printed photos of her. I’ll intersperse these among the knits. I cannot wait to see this! Even if no one else cares, I’m going to enjoy it. So there. 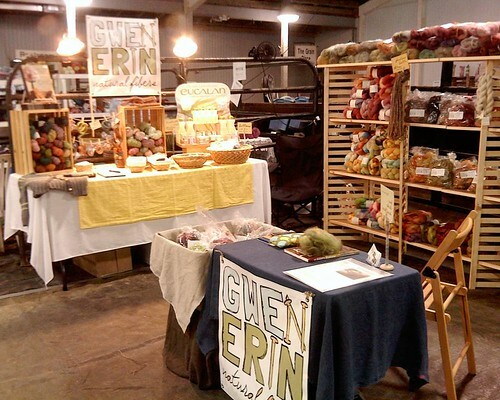 I often realize that there are many different facets to my business, Gwen Erin Natural Fibers. While it may have started as a knitting-focused endeavor, things have definitely changed. When I am at craft show, where most customers expect to buy finished goods, I usually get a few people who ask about my mitts as if I am there solely for the purpose of giving them ideas for their next personal knitting project. They flip the mitt over and over again, trying to figure out exactly how I created it. “Oh, I can do that,” they inform me. “I never said you couldn’t,” I think. Even though these interactions bother me, I’ve come to the conclusion that knitwear is not my primary focus. 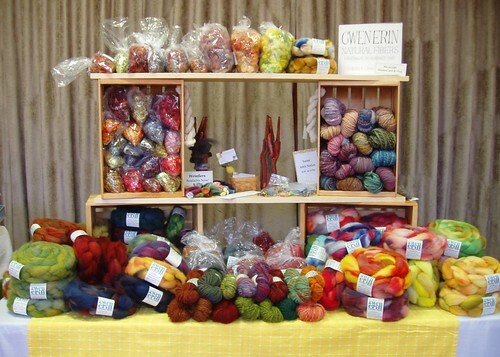 Rather, I am in the business of selling fiber and yarn. 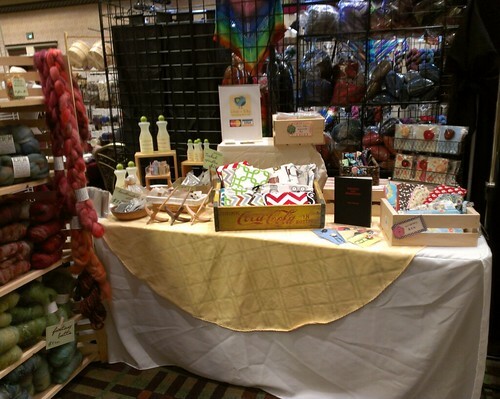 If I can encourage a customer to purchase yarn because they see what I’ve made with it, then I’ve still made a sale. I have now come to see my finished goods as samples-for-sale. Of course, if I were actually able to record the patterns for the things I make, all the better! There are two main types of events I participate in, and they have slightly different inventory. This can be confusing sometimes. Why didn’t I bring my spindles to the Holiday Art Show? Because I didn’t make them. Below I have outlined the major characteristics for these two types of events. In addition to “live” sales, I have had an online shop since 2008. Recently I shifted from using Etsy to using Storenvy. One of the main reasons I made this decision was financial. Also, I wanted to step away from the restriction of only selling handmade items (not that it really matters on Etsy anymore). My goal was to create a separate branch of the business, a way to differentiate the online aspect and keep it open during festival season. This led me to create a destashing shop. The fiber inventory listed there will only be available online. Having all these different aspects to my business can get confusing, but it also makes me very versatile. I can shift from one type of event to another, recreating myself as I go. 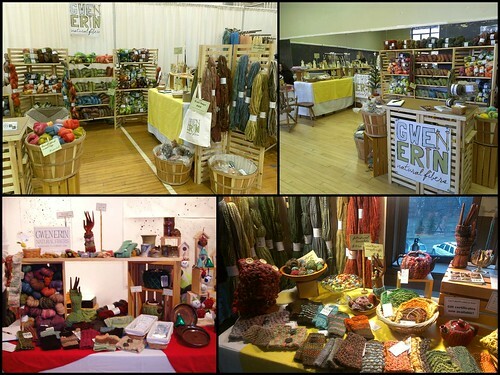 My display changes with the inventory, but the theme stays the same: natural fibers! And just like that, it’s over! 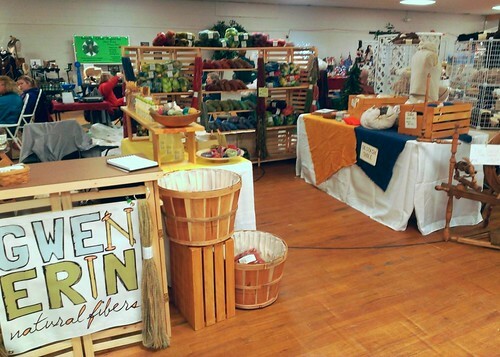 Thank you to everyone who attended and helped with the Autumn Fiber Festival on Saturday. It was a rainy day, but the building was full of shoppers. Hooray! And a special thanks to all of you who helped me with my “studio clean-up project” by purchasing any items from the destash table. Having a larger space than usual — 10×12 rather than 10×10 — allows for that extra table, so I think it will become a regular feature. Everyone needs to go through their stash now and then to give it a good scrubbing! Getting to the event on Saturday was a little nutty. Unfortunately I left my house 15 minutes later than I planned and then found out the event was 15 minutes farther away than I thought. That meant we arrived half an hour later than I expected. I only had one hour to unload and set up. It was crazy, but a few other people helped my dad bring in boxes while I started laying things out. In the end we got it done. I used a different configuration than I have in the past. It might not have had the best flow, but it worked well enough. 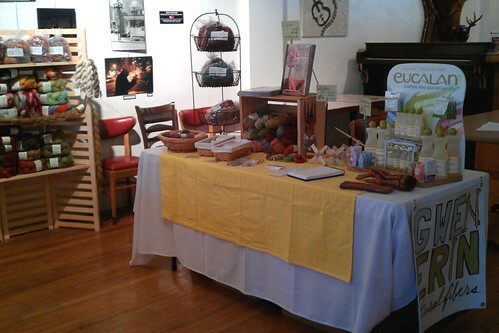 It was great visiting with so many friends this weekend and talking to several returning customers. Some even brought projects to share! 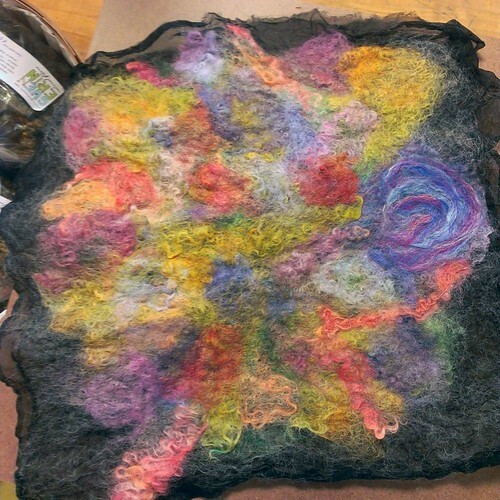 It is so exciting to see what people do with the fibers I dye. I get them started, but you make them into something special. Do you spin them? Felt them? Knit them? Crochet them? Keep bringing your projects to shows – I couldn’t be happier to see them. Oh, what a weekend! With a four day commitment, this is definitely the longest event I take part in all year. And I have to say, today I am exhausted and sore. My throat hurts from talking (shouting) and all my muscles are aching. 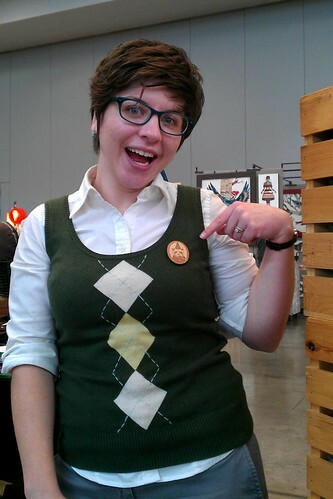 But I had a lot of fun with Ana from Wren & Rita, with whom I shared the booth. Thanks to her excellent spinning demo, we got 14 spindles out into the world — many to brand new spinners. If you weren’t able to make it out to this event, Ana and I will be at A Knitter’s Fantasy on April 6. Check out their website for more information. Here is the booth Ana and I put together for Handmade Arcade along with a picture of me showing off my birthday pin, you know, because it was my birthday. Since I just uploaded a few new pictures of my booth from the weekend, I started looking back at booths from previous years. The set up changes just a bit each time, so I always take pictures. I want to document a good idea, and it’s fun to see how much I’ve grown. 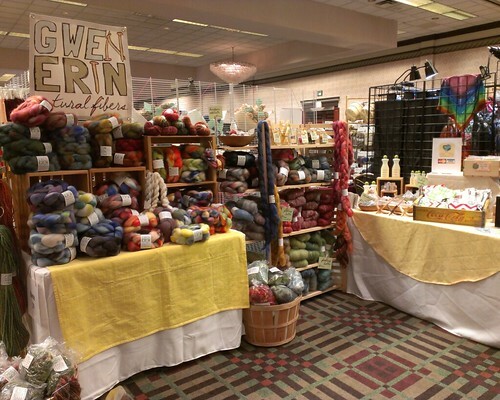 It’s kind of crazy when I realize I haven’t been doing fiber festivals very long. The first one I did was in April 2010. Let’s take a look. A Knitter's Fantasy. April 2010. 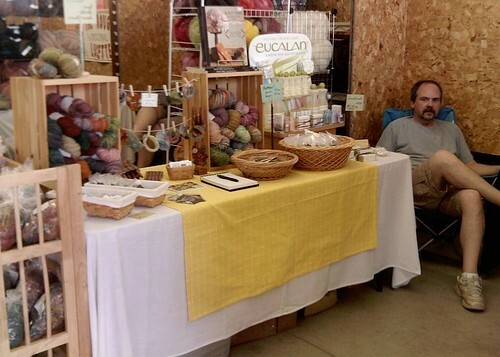 I didn’t do much else that year, so it wasn’t until the following February that I had another fiber festival. I shared a booth, so I only had a 4 foot table with which to work. 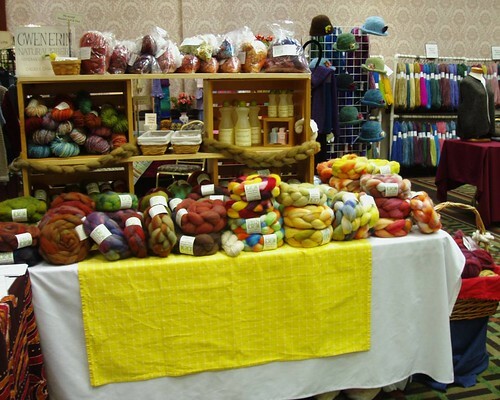 Pittsburgh Knit & Crochet Festival. February 2011. And then I was back at Knitter’s Fantasy again. A Knitter's Fantasy. April 2011. The next thing was Great Lakes for the first time. I had a 10×10 with tables on opposite sides, so it was hard to get everything in one shot. 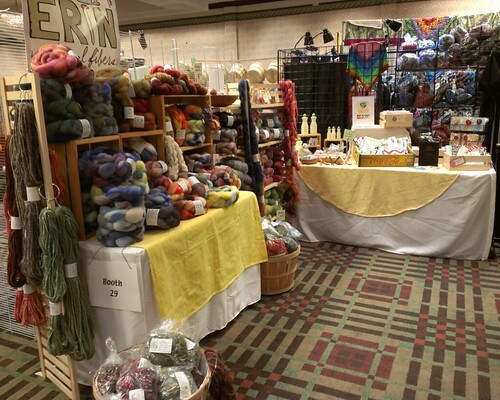 Great Lakes Fiber Show. May 2011. After that I didn’t have a fiber show again until November. I had to fit everything onto a 6 foot table. Indie Knit & Spin. November 2011. That takes us up to the beginning of this year. I started with PKC and a 6 foot table again. 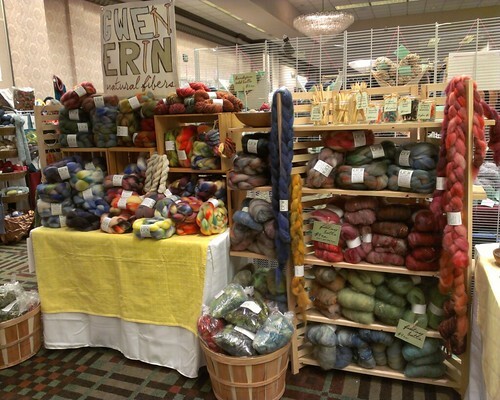 Pittsburgh Knit & Crochet Festival. February 2012. I had purchased a set of shelves and finally got to use them at a new show in March. 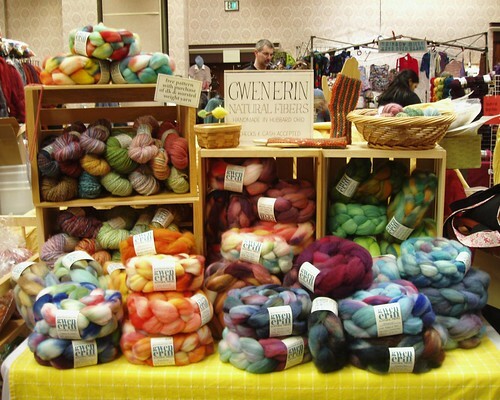 Women's Fiber Fest. March 2012. 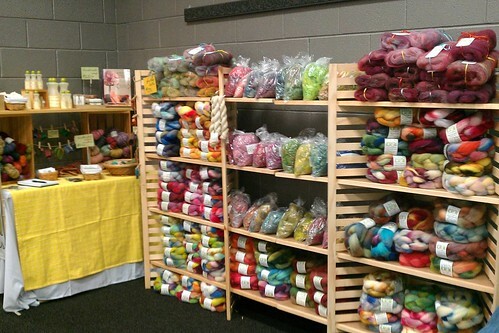 Things stayed the same until I had a different configuration at Woolfest. It worked out well and we tried a few new things with the shelves. And that brings us to the most recent event. I had a 4×12 booth, so it took a bid of work to fit everything in. We ended up rearranging things on the shelves all weekend. 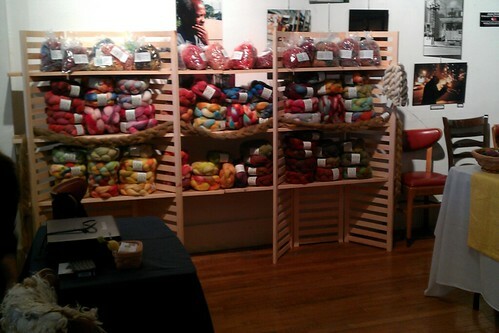 We moved the batts into the crates on the table and the yarn went into the center top section of the shelves. The locks took up the lower three center shelves. The entire left side was all Falkland and the right section was all roving. 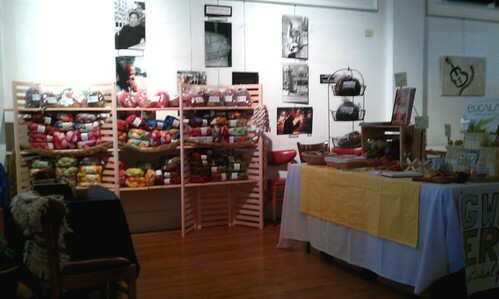 We also unwound skeins of yarn and hung them from the corners of the shelves. I suppose I should’ve taken a picture of the improvements. 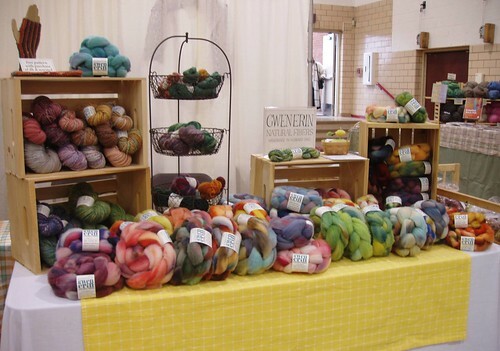 Mid-Ohio Fiber Fair. August 2012. Did you know I take a sedan to my shows? It’s a light blue 1994 Buick Century and I call her Gladys. We’ve been taking my car to all the shows because I can actually get more into it than Rich’s Saturn. Plus Gladys’ air conditioning works. Even though I’ve gotten very good at packing, it is still an incredibly stressful experience. In fact, I dread it every time. This time around I loaded the car alone on Friday morning. It’s really best if I do it myself because I know which bags shouldn’t get crushed and I may also be a control freak. But since this was an overnighter, I had extra to pack. We took our tent, a cooler, a bag of food, pillows/bedding, and a change of clothes. Out of every single thing that I cram into that car, the most irritating of all is that darn cooler! It cannot be squished and it is taller than every other thing. And last time I forgot about it, so it caused a lot of anguish at the end. I don’t know if I was just overly tired, feeling unenthusiastic, or already bordering on a breakdown, but it happened. As I tried to get the shelves into the trunk, I freaked out. I’m sure the neighbors could hear me screaming, “What is wrong with you?! You fit in there last time!! BLARRRG!” Also, I forgot that I had to go to my parents’ house to get the tent. And then I forgot the extension cord. Running around caused me to get on the road late (even though I had been ready 2 hours early) and I was afraid I would be locked out of the arena or something. But it actually went fine. We got there without too much trouble, despite a detour. I spent a very leisurely evening setting up the booth. Having the opportunity to set up Friday (rather than a hurried Saturday morning) is great. It gives you the chance to experiment and make adjustments. I tried something new this weekend and I loved it! Now we’ve got ideas for next time and more projects to do. Overall I had an awesome time there. Not sure what made it so great, but it was. I made a new friend, Marianna, who runs Peanut’s Fibers. We were set up next to each other and spent a lot of time exchanging tips. The weather was perfect. And the park was beautiful (more on that tomorrow). The event just had a nice casual, comfortable feeling. Going next year for sure! 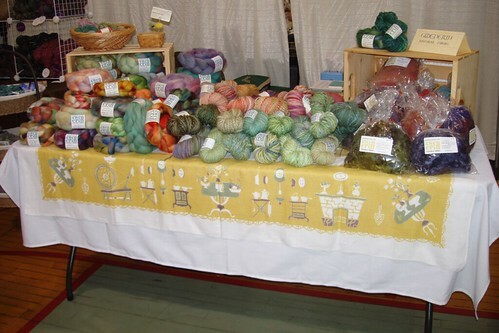 Taking a break from the accounting side of the business today to share a couple photos from the Great Lakes Fiber Show this weekend. 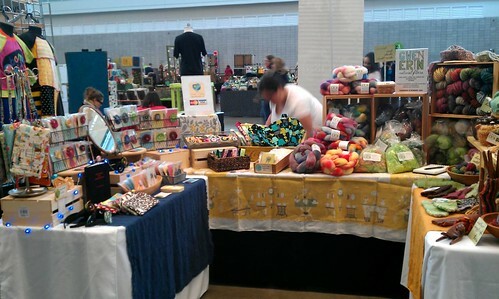 I didn’t get out too much to get a lot of fun pictures, so it’s just shots of my booth. I had a really good time this year. Attendance and sales were up, so I can’t complain. Also, I met a lot of interesting people. Some were returning customers and others had seen my ads on Ravelry! While I was there I picked up two lovely Shetland fleeces from the same fellow I bought from last year. Sadly I have no pictures of them because I immediately dropped them off to get processed. And I got an alpaca fleece that belongs to an alpaca named Gwen. How could I resist? I had fun! Hope you did too. Out of the house by 6:00 am. Set up by 8:30 am. Car packed by 3:30 pm. We packed the car up Friday evening because I knew it would be an early morning. Also, my back was hurting really bad, and I couldn’t do anything by myself, which is why Rich went along with me on Saturday (I love you). There was crazy thick fog the entire drive and it was still dark out when we arrived. I took my time getting this arranged, but I was pleased with the result. The shelves worked great and the table didn’t look too rambling. I thought I was extremely organized for this show, but I forgot a few things. 1) My Square reader! My first sale of the day was a charge and that was when I realized I didn’t have the reader. Thankfully I was able to borrow one from another vendor. Shortly after that I found it in my purse, but I never had any more charges, so I didn’t need it. 2) My camera, but since Rich has a “fancy” phone, I used its camera function. Even though we had such a nice location, there just weren’t that many visitors. Not sure if the weather was a factor. Maybe it was too nice outside on Saturday? I had not excepted things to be flying off the shelves, but I was a bit disappointed that it was as slow as it turned out to be. I actually sold more of my other items than anything I actually made. Uh oh. But I had a good time chatting with the vendors and shoppers. Plus Rich and I came up with a bunch of great new ideas for my business (while we were sitting there alone)!